Learn how to write a screenplay through detailed analysis of feature films. The majority of screenwriting books tell you that you should avoid using CUT TO: between scenes because it reeks of amateurish writing and quite frankly, it’s obvious that to go from one scene in a movie to the next, there will be a cut. New writers read that and typically remove every instance of CUT TO: from their scripts which can be just as bad as using it too much. Let’s start by looking at what CUT TO: really is. It’s a transition. Transitions exist to connect the ending of one thing with the beginning of something else. Because film and television are visual mediums, the transition between scenes when using CUT TO: (or MATCH CUT TO: or SMASH CUT TO: or DISSOLVE TO: or FADE TO: ) should be visual. Simply going from a scene of two people talking on a date to a scene of the guy walking the girl to her car after the date is over doesn’t warrant a visual transition. It’s a natural progression and we can assume that time has been ellipsed. That’s the situation with MOST scenes. There are, however, times when a visual transition helps us to better understand the content. The simplest example is the fade that is often used when a character begins to remember something in the past. The fade is a common cinematic element that signifies the transition from what’s happening in the present to a scene that happened previously. That’s an easy one. CUT TO: is much more subtle. We use CUT TO: when we want to make a point of ending the scene where we did. For example, if you end a scene on a character telling his wife that he’s sorry for cheating on her and it will never happen again, and the beginning of the next scene is him in bed with another woman, adding CUT TO: makes sense. It brings attention to some sort of disparity between what was conveyed in the previous scene with what’s happening in the current scene. Sometimes it’s used for comedic affect, sometimes irony, or in the aforementioned example, to punctuate the character’s lie to his wife. It tells the reader that there is a visual disparity about to happen so pay attention. On the screen, the disparity will be obvious to viewers, but on the written page, it can be more easily overlooked by the reader. Thank you for clearing up a big question for me. The information that was out there had me so confused I gave up using CUT TO altogether. Thanks again. Happy to read this helped. Thanks, Ken. Hey, cranky old man- go the hell to bed and be sure to take your prune juice so you can leave a healthy crap in the morning. 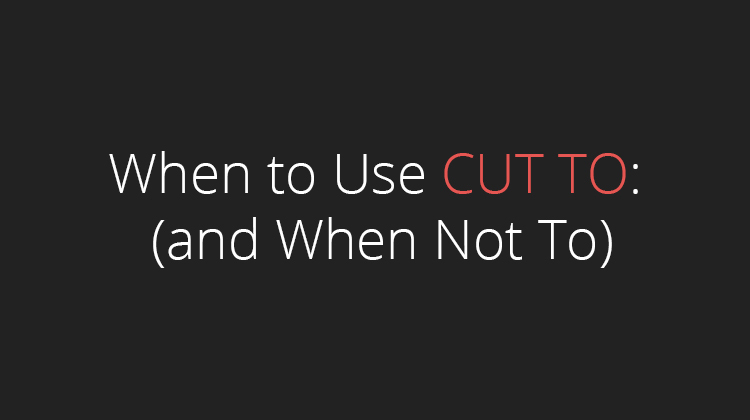 Use CUT TO, don’t use CUT TO, use it, don’t use it…WTF?!? There’s so much contradicting advice out there, it’s ridiculous. Agreed. I just got a scathing review based on that and was told I had not read many scripts (untrue). Went back and looked at some classics. Guess what they use? “Cut to:”, even when just moving from an office to a reception area, a “natural transition”. Ugh! All a crap shoot. You write a script in order to pass a message, tell a story and make it accessible. A cut after each scene (and often within) is a clear thing, so when mentioned extra, it’s some sort of an underline for the obvious. If you find yourself underlining a whole text, you can be sure it’s not making sense. If you don’t need to underline text, it means the text doesn’t need it. Feel your script and you’ll feel the “cut to:” if you feel it too often, you must work on your confidence during writing. Main thing, write a good story and make it readable. MERCY and JOSEPHY are playing netball . So is it wrong how I used transition of CUT TO? I wouldn’t use “CUT TO” in that instance. Hello. If you are writing action and you are going from looking at a table, then jumping to a shelf filled with books, then jumping to a chair on the floor, then jumping to a few other things, are you to use CUT TO:? Based on all the things I’ve read, that makes sense to do, but so much at times seems to contradict itself. Sorry for taking so long to reply, Jent; I don’t often check the site much anymore. In your case, I would use “CLOSE ON.” But you may not even need that. It’s likely enough to simply describe what’s happening. Sign up for email updates and exclusive content. What’s the Climax of Good Will Hunting? Copyright © 2016 ScreenplayHowTo. All rights reserved.